Kurtz Trading strives to offer quality used equipment at reasonable prices. We thoroughly inspect all of our equipment to ensure all functions operate as they should, all fluids are at the proper levels, and that there are no major mechanical issues. We operate the equipment for 20-30 minutes to ensure the equipment operates properly under a load. Used equipment conditions vary, so we strongly advise communicating directly with you about the item you are interested in. This allows us the opportunity to describe the equipment in detail, answer any questions you have, and ensure you are getting what you expect. We provide pictures and a video for each item, but will be happy to provide any additional photos you may need. Equipment That is Coming In Soon! Once the item arrives and has been inspected by our shop we will post pictures and a video. We will be able to answer most questions about the item, but cannot guaranty details until we have received and inspected the item. All of our attachments are tested to ensure their functionality and overall condition. We encourage you to call and confirm the attachments compatibility to your specific equipment. We provide pictures and, if applicable, a video for each attachment, but will be happy to provide any additional photos you may need. We are required by law to collect this in both states because we carry a resale certificate in both PA and MD. 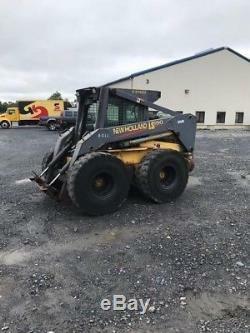 The item "2001 New Holland LS190 Skid Steer Loader with Cab NO DOOR 2 Speed Coming Soon" is in sale since Saturday, October 13, 2018. This item is in the category "Business & Industrial\Heavy Equipment, Parts & Attachments\Heavy Equipment\Skid Steer Loaders". The seller is "kurtztrading" and is located in Littlestown, Pennsylvania. This item can be shipped worldwide.